Strategic management is a continuous process that centers on the analysis, decisions, and actions an organization performs in order to create and sustain competitive advantages. It deals primarily with making and implementing decisions about the future direction of an organization and creating a strategic plan to achieve their goals. It incorporates various functional areas of an organization to ensure these areas are synchronized to efficiently achieve the common objectives. 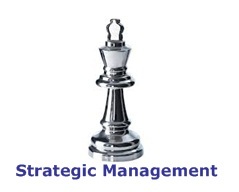 Strategic management plays a significant part in the performance of an organization and its members. Fundamentally, it is about managing resources and employees in a manner that maximizes the ability to achieve organizational objectives. Its purpose is to mobilize the resources and energies of the organization to achieve the future that the leaders have envisioned. The more effectively the strategic elements are aligned and in-sync, the better the performance of the individuals and the organizations as a whole. The strategic management process involves delineating, implementing, and evaluating the organization’s strategy so that the organization will be able to best achieve their performance goals and attain a competitive advantage. This continuous process begins by assessing the business and industries in which the organization is involved as well as its competitors. After which, the organization establishes objectives to meet all the present and future goals, and then formulates the best course of action for accomplishing those objectives. The implementation stage that follows includes designing the organization’s structure, allocating resources, and managing people. Finally, the organization measures and evaluates the results in order to assess the overall strategy. 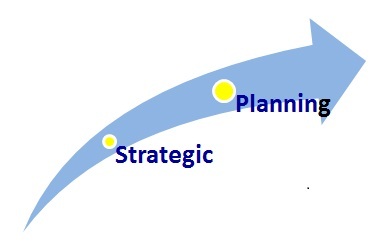 There are four main phases or stages of strategic planning and management. Assessment – Understanding the current internal and external environments as well as the company’s vision, mission, values, and strategic objectives. 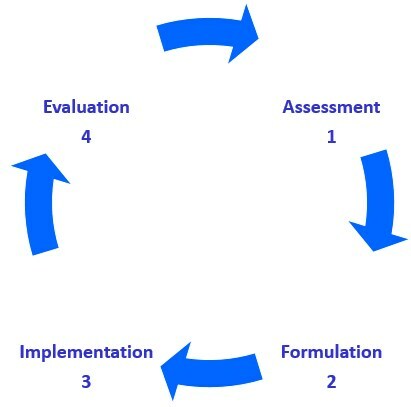 Formulation – Developing and documenting a high level strategy and a basic organization level strategic plan. Implementation – Breaking down the high level plan into more operational steps and action items and managing resources, people and change. Evaluation – Capturing and measuring results as well as monitoring performance, resources, and the market. The first step strategic management process is to determine the current state of business by assessing the internal and external environments of an organization. The leadership team typically conducts a SWOT Analysis (Strengths, Weaknesses, Opportunities, and Threats to assess the external and internal environments. This systematic analysis of the factors associated with external environment and the internal environment provides the basis for the strategic plan. Analyzing strategic goals includes organization’s vision, mission, values, and strategic objectives. In this stage, the leadership team make strategic decisions about the future direction of the organization. They will first develop a high level strategy, and then they will develop a basic organization level strategic plan by formulating new organizational objectives. They will also determine strategies and specific actions for reaching those objectives. Capturing and measuring results is an essential activity in this phase. Leaders have to compare actual results with anticipated results to see if adjustments need to be made. The second part of the evaluation stage is to re-evaluate strategies on a regular basis. Due to constantly changing external and internal conditions organizations must continuously monitor and review both environments. If circumstances arise that affect the company, leaders must take corrective actions to ensure objectives can still be achieved.